Two years after the release of their debut album, Manifest Density, Seattle-based quintet Moraine enjoy an impressive reputation as one of the most eclectic outfits on the modern progressive rock scene, purveyors of music that, while constantly dynamic and challenging, is never devoid of atmosphere and melody. In the months between the release of the album and their career-defining performance at NEARfest 2010, the band, led by veteran guitarist and composer Dennis Rea, underwent a lineup change, with the departure of cellist Ruth Davidson and drummer Jay Jaskot that determined a distinct shift in their sound. For their sophomore effort – bearing the brilliant name of Metamorphic Rock, which, like the band’s own, reflects Dennis Rea’s passion for geology and mountaineering, as well as referring to the metamorphosis undergone by the band – Moraine have chosen a rather unconventional format. Though it is a live album, capturing their NEARfest set in crystal-clear detail, it focuses on new, unreleased material as much as on compositions originally featured on Manifest Density. The latter have been rearranged to accommodate the obvious differences in sound due to the presence of a baritone saxophone instead of a cello, their running time often extended as if to indulge the average prog fan’s preference for longer tracks. With five members coming from very different musical backgrounds, Moraine are quite unlike conventional prog bands in being much less prone to reproduce their compositions verbatim when on stage, and thrive on freedom of improvisation. This diversity results in a headily eclectic direction, blending rock with jazz, funk, blues, world music and avant-garde, which however never descends into the sprawling “kitchen sink” approach adopted by many acts, with often debatable outcomes. Since its very beginning, Moraine has been a collaborative effort, with every member getting an opportunity to contribute to the songwriting – even if Dennis Rea gets the most credit on this album as a composer. As much as he is the band’s mouthpiece and most experienced member, even a cursory listen to either of Moraine’s albums will reveal a dense, tightly woven structure in which all instruments bring their own distinctive voice, and no one overwhelms the other. The 11 tracks chosen for the band’s NEARfest set highlight their unique dynamics and the wide range of influences and ideas that characterize their compositional approach. Traces of their beginnings as a “chamber rock” outfit (or, as Rea puts it, a string quartet with drums) emerge occasionally throughout the set, but the definite rock turn taken by the band is hard to miss. In its three minutes, opener “Irreducible Complexity” effectively sums up the “new” Moraine: written by James DeJoie, it emphasizes how seamlessly the saxophone has become part of the whole, replacing the solemn drone of the cello with its more forceful tone, acting both as foundation (together with Stephen Cavit’s understated but subtly propulsive drumming and Kevin Millard’s versatile 8-string bass) and as a protagonist, in combination with the flowing, melodic strains of Alicia DeJoie’s violin and Rea’s clear, almost tinkling guitar. Interestingly, the majority of Moraine’s compositions seem to make use of a leitmotiv device, a main theme, generally introduced right from the beginning, which crops up in different parts of a song, rendering it more memorable as well as more cohesive. This device is also explored by “Manifest Density”, with its catchy guitar-sax-violin riff, and the more angular “Kuru” – as well as newer material like the hauntingly majestic “The Okanogan Lobe”, and the forceful, slightly chaotic “Waylaid”. Like many of those RIO/Avant bands they have often been compared with, Moraine balance beautifully melodic, lyrical sections, dominated by Alicia DeJoie’s soaring violin, with others where a carefully controlled chaos seems to reign. “Uncle Tang’s Cabinet of Dr. Caligari” represents the band’s noisier side; while in the 10-minute medley of “Disillusioned Avatar/Dub Interlude/ Ephebus Amoebus”, all the different souls of Moraine are given a voice – from the gorgeously melancholy, violin-driven beginning – a masterpiece of careful atmosphere-building with its loose, rarefied texture – to the lazy reggae pace of the “dub interlude” (which allows the rhythm section to step into the limelight), finally climaxing with an effects-drenched, free-jazz workout. 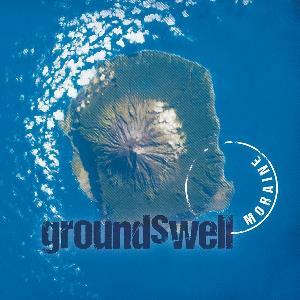 Running at almost 12 minutes, the amusingly-named “Disoriental Suite”, based on Dennis Rea’s solo album Views from Chicheng Precipice illustrates Moraine’s more meditative side, opening with a gentle, lilting melody enhanced by James DeJoie’s flute, and culminating with a sparser, more experimental, violin-led section. As its title implies, the somber mood of “Blues for a Bruised Planet” – a fresh take on the old warhorse of the blues ballad – expressed by the mournful voice of the sax and reinforced by violin and guitar, stems from Dennis Rea’s deep concern with the sorry state of Planet Earth. My personal favourite from the band, the towering “Middlebräu”, closes the album with a bang, its funky intro followed by a short, snappy drum solo, and then culminating with the gorgeous, slow-motion coda in which the interplay between guitar and violin reaches unparalleled heights. The sheer quality of the recording (mixed by legendary Seattle-based engineer Steve Fisk) and the brilliance of the individual performances more than compensates for the editing of Rea’s unassumingly witty on-stage banter – my only quibble about an otherwise outstanding album. As I pointed out in my review of the 2010 edition of NEARfest, Moraine were by far the most authentically progressive band on the bill. Moreover, their particular brand of “East-meets-West” is quite far removed from cheesy attempts at exoticism for its own sake, but rather motivated by genuine love and interest for different musical modes than ours. Needless to say, Metamorphic Rock is unlikely to be fully appreciated by symphonic prog traditionalists, especially those who object to the absence of keyboards, but it is otherwise highly recommended to all open-minded prog fans. Another contender for my personal Top 10 of 2011 – hoping for a third album some time in 2012. Seattle-based band Moraine, one of the most interesting finds by MoonJune Record’s volcanic mastermind, Leonardo Pavkovic, first came to the attention of the progressive rock scene in 2009, with the release of their debut album Manifest Density. Their reputation as purveyors of complex, intelligent and energetic music with a definitely eclectic bent – chamber rock with an edge – was consolidated by their exhilarating performance at the 2010 edition of NEARfest, and, earlier this year, by a short but successful East Coast tour. With the official release of their second album, Metamorphic Rock (recorded on the occasion of the above-mentioned NEARfest appearance) less than a month away, band members – guitarist Dennis Rea, violinist Alicia DeJoie, saxophonist Jim DeJoie, bassist Kevin Millard and drummer Stephen Cavit – have kindly agreed to share some of their thoughts and experiences on behalf of my readers. Let us start with a rather unoriginal, though obligatory, question. How did the band come into existence, and what was the reason for its inception? Dennis: Speaking of metamorphosis, Moraine has mutated so thoroughly since its inception that its origins as a free-improvising duo between myself and cellist Ruth Davidson are barely discernable now. The project began as a casual series of get-togethers with no specific agenda; there was certainly no expectation that it would evolve into the type of band it is today. As the musical relationship deepened, both of us brought in some compositions and it soon became apparent that the music would benefit from additional instruments. So we enlisted violinist Alicia DeJoie and drummer Jay Jaskot and named the newly formed band Moraine, a term denoting the debris carried along and deposited by a glacier, very apt for our part of the world. I had worked with Alicia in singer-songwriter Eric Apoe’s group They and knew that she would be perfect for what I had in mind. Jay had been the drummer in my late-90s band Axolotl and we had always been keen to continue our musical partnership. After briefly trying out a couple of bassists, we found the ideal fit in Kevin Millard, who had played with Ruth back in their native Minnesota; it was an odd coincidence that I met the two of them independently. This lineup persisted for a year or so until Ruth departed for graduate school on the East Coast and Jay relocated to New York City. The drum chair was filled by Stephen Cavit, a longtime musical associate of mine who, in addition to being a phenomenal drummer, is also an Emmy Award–winning film composer and choir director. We considered replacing Ruth with another cellist but didn’t know any in Seattle who had the right temperament for this particular project, so we decided to deploy woodwinds (primarily baritone saxophone) in place of cello. James DeJoie was an easy choice for this role because he is not only one of the finest and most versatile saxophonists in the Pacific Northwest, but also is married to Alicia and thus had already grown familiar with our repertoire. This lineup has been in place for about two years now, and there’s every reason to believe that it will continue indefinitely. Most of the interviews I have read so far seem to focus on Dennis Rea’s background. However, this time I would rather concentrate on everyone else’s experiences prior to joining the band. What prompted you to join, and how different are Moraine from your previous (or even current) musical experiences? Alicia: When Dennis Rea approached me about Moraine, I was immediately interested. I had played with Dennis before and had greatly enjoyed it, profoundly impressed by his unique sound and compositional prowess. I had also seen him in the group Axolotl and absolutely loved that band, and was very excited to learn that Moraine would be doing some tunes in common. Moraine is unlike any band I’ve ever been in – our sound is unique, ultra-creative, yet what I like to think of as approachable. In addition to the musical camaraderie shared amongst us in the band, we all get along extraordinarily well as people, which is another aspect of the group I love and appreciate. Jim: Prior to joining Moraine, I was doing a lot of jazz (well, still do!). I’ve always played in a few large ensembles as well as my own groups. I feel I have a little different take on “jazz” than most, by including “rock” and “pop” elements into the revered jazz world. I have been into using effects on my saxes, flutes, and clarinets for years and really love exploring the sounds created with what are essentially guitar efffects. When Ruth Davidson (Moraine’s cello player) left the band to continue her educational pursuits, Dennis asked if I would be interested in joining. The range of the bari sax and bass clarinet seemed an appropriate replacement for the cello (and they were rehearsing at my wife’s and my house!). I did have some reservations at first, only because I knew my sound would be a completely different thing for the group. I said “yes” with the condition that if it didn’t work out, Dennis could fire me – no hard feelings. Needless to say, I think it’s working out fantastically! Stephen: When Dennis called me to potentially replace Jay (how is that possible?!? ), I was fully engrossed in my composition career — during which time I’ve won an Emmy Award and been named a Sundance Composers Lab Fellow, among other great honors. I had been pretty active in the Seattle music scene before returning to live in Los Angeles for work in early 2000. When I made it back to Seattle a few short years later I found the scene had changed substantially and I didn’t recognize many of the new faces. Which is what made Dennis’ call all the more sweet: I was really jones-ing to perform again! Kevin: My earliest musical experiences in Seattle (having moved here in ’96) were in the experimental music circles; I met Dennis back then. He was playing in a band I adored called Axolotl, and my own band at the time (Panopticon, we called ourselves “avant-groove” or “trailer park jazz”) briefly shared a practice space with them. I also had known Ruth back in Minneapolis; when she moved here, I introduced her to Dennis’ music. Fast forward several years: imagine my delight to find they had formed an amazing band. A month after seeing Moraine for the first time, their bassist left town suddenly. I auditioned, and the fit was very natural. I love playing music with such good friends. The band’s music itself is very close to my heart, being a fan of Dr. Nerve, Univers Zero, and 70’s King Crimson. What is your approach to your respective instruments, and to the compositional process? What about your main musical influences? Dennis: In a word, I am nondoctrinaire in my approach to playing the guitar; that is, I don’t subscribe to any particular doctrine, ideology, or school of playing. I’m not a jazz guitarist, I’m not a rock guitarist or avant-garde guitarist, but simply a guitarist who is free to exercise any of my many musical interests. Although I started out taking the standard lessons like everyone else and have periodically studied this or that aspect of music making, I’ve had relatively little formal musical training. I long ago came to the realization that my gift is my ear and that a more intuitive, listening-based approach suits me best. I can read music with a gun to my head but prefer to communicate simply through playing whenever possible. Some people have commented that my playing has a ‘searching’ quality, and that’s because I am literally searching for the right note or phrase rather than following patterns and formulae. As for composing, most of my tunes begin with a single musical motif that gets embedded in my mind; from there I begin crafting variations and complementary parts for my fellow musicians. I typically compose the other players’ parts in my pieces while making sure to leave them ample room for soloing and interpretation. Most of this polyphonic writing actually takes place in my head rather than on paper, when I’m walking down the street or doing something similarly innocuous – I seem to have the ability to hear fully formed pieces in my imagination. I then bring the parts to the other musicians at rehearsal, either in written or recorded form or transmitted using a sort of musical onomatopoeia. Alicia: My approach to the violin is to be as present as I can with the instrument while I’m playing, yet free enough to plunge into the unknown, stretching the gamut of sounds the instrument is capable of making. The solid, sonic landscapes laid down by Moraine compositions provide compelling foundations which inspire me to explore myriad melodic and rhythmic elements when soloing. The compositions I’ve brought to Moraine have all started at the piano and migrated to the different instruments from there. I love knowing that when I bring a new piece to rehearsal, the rest of the band will contribute much more with their unique sounds and ideas. Every piece is then honed, enhanced, and ultimately transformed into an expression of the entire band. Jim: Well, I’ve always approached all my instruments with the mantra “sound first.” In other words, tone and passion – the effects I use are extensions of my acoustic tone and feel. Compositionally, my ideas generally come from the sax and piano – once an idea starts, I try to keep fleshing it out until it feels done – I have many, many unfinished pieces! My main influences are wide: John Hollenbeck, Miles Davis, Yusef Lateef, Ornette Coleman, and Tom Waits are some of my personal heroes. Of course there are many others: Eric Dolphy, George Crumb, Morton Feldman, Jim Black, Chris Speed, Portishead, Battles, Anthony Braxton, Dave Douglas, David Bowie… There is so much great music to explore. Stephen: I haven’t written anything for Moraine, probably because I am not a tune writer and feel more than a little intimidated by the prospect, but I do have a very developed process when it comes to scoring for film….. I have pretty broad influences and, in regards to drumming, I would cite Paul Motian, Ed Blackwell, Gene Lake, and a few others of that ilk as my favs. When I first joined Moraine the music seemed to have a free-flowing jazz sensibility, more so than the driving rock sound it has today. The music spoke to me in that way and I feel, as a whole, our arrangements became tighter and more dynamic as a result of that shift. In terms of what I listen to daily, I am mostly a classical music junky. I enjoy Eastern European post-minimalism, in particular, including most of the usual suspects like Arvo Part and Henryk Gorecki and some possibly lesser known composers like Petris Vasks. It’s hard to say how that listening effects my drumming on a conscious level, but I’m certain it does. There’s a much more direct influence on my choral, concert and film work. Kevin: I am a bit of a “red-headed stepchild” in Moraine, given that I don’t read music and am self-taught on tapping instruments and bass guitar. (I’m not ashamed to admit that the Violent Femmes and Tones On Tail helped inspire me to take up the bass.) But when I picked up my first Chapman Stick, it encouraged my dabblings in music theory and into “fancier” music. My only real ‘bass idol,’ as it were, is Mick Karn (RIP) – a humble, self-taught iconoclast whose lack of formal training helped him develop his own unique tones and voice. As for composition, I am not much of a tune-writer, having contributed only one tune to Moraine thus far (which was a tune I wrote for Panopticon). I prefer to take more of a collaborative approach to writing music, probably because I am secretly a lazy man. How has Moraine’s sound developed since its beginnings, and how did it change with the addition of Stephen and Jim? 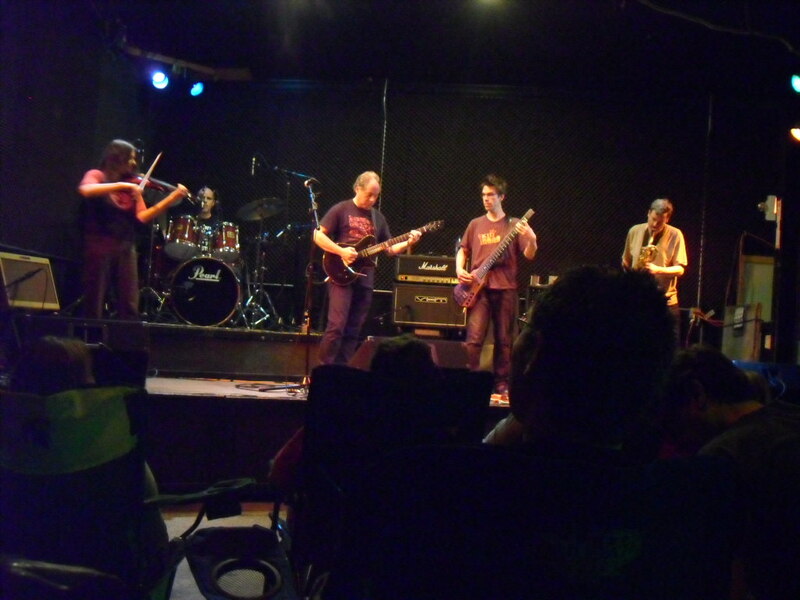 Dennis: As mentioned previously, the group began as a free-improvising duo, morphed into a sort of chamber-rock quintet with a ‘string quartet plus drums’ configuration, and then arrived at its current lineup of guitar, violin, woodwinds (including flute), drums, and bass (an eight-string NS/Stick, to be precise). The net result of this transformation is that we are much more of a rock band now, albeit one that is just as likely to make excursions into jazz, world (particularly East Asian) music, and any other musical dialect that interests us. The addition of Stephen and Jim pretty cemented our current, more forceful approach, for a number of reasons. For one thing, we had often faced challenges making the cello heard in an electric band setting due to issues with amplification, feedback, and overlapping range, whereas Jim’s baritone saxophone, fitted with a microphone, cuts through loud and clear. And unlike his more straightahead jazz gigs, Jim sees in Moraine an opportunity to explore creative sound processing, so his use of various effects such as harmonizers further beefs up the group sound, to the point where it’s almost as though we have a second heavy-duty guitarist on board. Alicia has recently begun incorporating more effects into her sound as well, which opens up a whole other set of possibilities. Our previous drummer, Jay Jaskot, is a gifted musician whose heart really lies in jazz. With Moraine, he tended to play freely across the bar lines rather than delineate the transitions in our compositions. This approach often produced marvelous results, but as our repertoire grew increasingly intricate, the music called for a more architectural rather than free-flowing style of drumming. While Stephen is also adept at playing jazz, his parallel career as a composer brings a more structural approach to the music, thus enhancing dynamics and lending more drama to the music. Since I was present at NEARfest 2010, where I had the pleasure to meet all of you for the first time, I am interested in your take on the whole experience – especially as the future of the festival seems to be hanging by a thread. I also know that most of you had had no involvement with the “prog scene” prior to the release of Manifest Density. What have been your impressions so far? Dennis: For us, NEARfest was a dream gig in every respect. We were frankly stunned to have been invited, given our exceedingly low profile among progressive rock enthusiasts at the time. Indeed, I saw quite a few “Who?” responses to the announcement in Internet forums. That makes it all the more satisfying that our set was not only well attended but very enthusiastically received. To put things in perspective, our gigs in Seattle are typically in small dive bars and cafes for about 10-20 people. We’ve landed some decent gigs at local festivals and performance series, but nothing remotely approaching the caliber of NEARfest. It goes without saying that we had never experienced such top-flight sound, lighting, and acoustics as a band, and indeed that’s what made Metamorphic Rock possible. For starters, the warm hospitality and overall good vibe fortunately elicited one of the band’s best performances to date. The recording we obtained from NEARfest was of superb audio fidelity, and subsequent mix work with legendary Northwest producer / sonic genius Steve Fisk and mastering wizard Barry Corliss made it even richer. It’s the best-sounding specimen of my own playing ever. I was especially blown away to find myself sharing a stage with what was essentially Gentle Giant (Three Friends), one of my towering musical icons. And the experience of connecting with so many like-minded people (yourself included) was priceless. I was dismayed at the sudden, unexpected cancellation of this year’s NEARfest – since we played on the festival’s last day in 2010, I sometimes quip, ‘Was it something we played?’ Seriously, I really hope that the organizers regroup and come back stronger than ever next year, and some of them have indicated to me that they will. I really don’t want to get caught up in the controversy over why public support for NEARfest dropped off so abruptly this year, though I suspect that part of it is that a certain segment of the once-loyal NEARfest audience doesn’t have the patience for newer bands like ours. Alicia: We had a fabulous time at NEARfest 2010. I was thrilled at the response we received there, as well as the wonderful contacts we made and have kept since then. Our East Coast tour in the spring of 2011 was a small reunion of sorts with many of the people we met at NEARfest, which makes the release of our upcoming album Metamorphic Rock: Live at NEARfest that much more exciting to us. Jim: I loved the experience. Usually, I consider myself a “journeyman” in a lot of groups – sort of show up and play and try not to make too many requests. But the NEARfest people were so accommodating and nice, it made the whole time a great experience (and for once I didn’t feel bad asking for more of me in the monitors!). The “prog scene” seemed really cool to me – full of people who truly love and are excited about music, a phenomenon not always associated with the “jazz” crowd. I’m disappointed to hear that the festival may not be happening in the future. Stephen: If having two drum techs is any kind of a taste of heaven, then I will be sure to be a good boy! We were so well cared for by people who clearly had a passion for this music. Fortunately, I was the only band member not to have any of the famous, high-octane espresso before the gig (I don’t drink coffee); otherwise, it’s possible Metamorphic Rock would have turned supersonic!! Kevin: NEARfest was such a fantastic experience. Having such an accommodating and friendly technical staff was a special pleasure (heck, having *any* technical help at all was a rare treat for us!, but seriously, the NEARfest crew was superb). The coffee before the show was truly world-class. And playing through not one but TWO full SVT 8×10 stacks was wish-fulfillment fantasy for me. If NEARfest is, or was, the prog scene, then I look forward to more! Such great audience and staff as well. You recently completed a 4-date tour of the US East Coast. Do you consider it a success, or do you wish you could have done something otherwise? Dennis: Though it was a modest tour by most measures, we felt that it was an almost complete success, marred only by some problems with borrowed equipment and a rather thin turnout in Philadelphia, but it was after all a Sunday night. Even so, we played very well that night and went down great with the the audience. Overall we received a tremendous response at every tour stop and offers to come back anytime (and we will). It was an almost disorienting contrast to our usual lot in Seattle (more on that below). In several cases people traveled long distances to see us, which was humbling; some had seen us the previous year at NEARfest and wanted more. Audience enthusiasm was palpable, and that fed into the music and charged up the performances. What’s more, we were astonished to actually break even on our travel costs through admissions and merchandise sales, which was wholly unexpected. We’ve also noticed that the touring experience has lifted us up to a new level of confidence and tightness – the Seattle shows we’ve done since then have been very high-energy. Playing East Coast venues did underline our isolation in faraway Seattle. It was hard not to conclude that there is far more support for progressive rock in the U.S. Northeast than out in the Northwestern Hemisphere; folks back there might not think so, but all things are relative. Naturally, this makes us eager to return for more, but the geographical distance makes it a steep challenge to bring a five-piece band across the country without going deep in the hole. But we’ll be back, one way or another. How did the new tracks featured on Metamorphic Rock come about, and what makes them different from the material on Manifest Density? Dennis: What’s different about our newer material is that it is being written expressly with our current instrumentation and musical personalities in mind, whereas many pieces on the previous two CDs were written before Moraine was formed and then adapted for our specific instrumental resources. Everyone in the band has a stake in the new material, and most of us are writing. There are also different considerations when writing for woodwinds rather than cello. This will be apparent to those who listen to Metamorphic Rock who’ve also heard Manifest Density. We considered releasing a shorter version of the concert at first, to avoid repeating tracks that appeared on the first album, but found the total listening experience to be so cohesive that the energy would be sompromised by removing any pieces from the set list. We felt that it was excusable to reissue tracks from Manifest Density because with the new lineup, the arrangements are sometimes dramatically different from the previous versions. I’m pretty confident that people will be down with the record’s mix of new and refashioned material. I know that you have been asked about your name more times than you care to admit, so this time I would rather inquire about the new album’s name, which sounds fantastic. Does it have anything to do with the Pacific Northwest being a heavily volcanic area? Dennis: Not exactly, as volcanic rock is considered igneous rather than metamorphic rock. Due to the geological nature of our name, I like the idea of threading that theme through our work, not because it has any direct bearing on the music itself but because it’s a perennial area of interest for me. In fact, one of the song titles on Metamorphic Rock, “The Okanogan Lobe,” continues the theme, for the track’s namesake was a feature of the vast ice sheet that once covered parts of Washington State. Strictly speaking, metamorphic rock isn’t related to moraines, except in an incidental way. Metamorphic Rock occurred to me in a flash of insight as the perfect way of answering that perennial question dreaded by musicians, ‘What type of music do you play?’ In our case we play a variety of rock music that continually seeks to transform itself, hence metamorphosis, hence Metamorphic Rock, which also plays on rock music and underscores that our music-making is a dynamic process. While Seattle is commonly perceived as a sort of mecca for rock music, I know your experience is rather different, especially as regards getting opportunities for live performances. What are the main strengths (if any) and weaknesses of the Seattle scene? Dennis: Seattle gets a lot of hype for being a happening music town, but personally I think it’s greatly overrated. As in any city its size, you can find many fabulously gifted musicians working in any genre you can name, but by far the lion’s share of opportunities and attention go to unimaginative indie rock and, lately, the fad for stovepipe-beard neo-Americana. There is no prog scene as such, and while there are a fair number of musicians whose music more or less fits that description, venues that will occasionally present that sort of thing are rare as hen’s teeth, and attention from the local music press scarcer still. Apart from the local jazz publication, where we have allies, Moraine has never received a single mention in any of the Seattle weeklies or arts/music scene rags – and yes, we do send them our CDs and press releases. But if I were to tattoo a middle finger on my forehead, guzzle a flask of Jägermeister, moon the audience, and throw up on the drummer, I can guarantee that there’d be a breathless feature profile of me in the local paper the following week 😉 While Seattle certainly has no monopoly on this sorry state of affairs, the fact remains that for a majority of listeners, physical appearance and attitude trump the music itself. Lately I’ve seen some signs of a possible resurgence of interest in progressive rock out here, but it seems to be facing resolutely backward. For example, I came across a ‘Seattle Progressive and Art Rock Community’ Facebook group with great interest, but all I ever see discussed there are things like announcements of Kansas and Return to Forever concerts and calls for forming yet another Genesis tribute band. The few postings I’ve seen or submitted about live local progressive music events have been met with total radio silence – most of these folks would apparently rather hole up with their ‘70s records than support a living artform. In fact, I just heard about a local prog nut who passed up seeing a best friend’s first public performance in 10 years in favor of going to listen to old prog LPs at a local bar. There seems to be a persistent perception among many (particularly older) prog fans that local music is somehow always inferior, and that nothing can ever live up to the gold standards set by their ‘70s heroes. But not to dwell on the negative… Whatever challenges Seattle progressive musicians face in terms of bookings and publicity, we’re blessed with an incredibly rich community of gifted musicians working in the areas of avant-rock, leading-edge jazz and improvised music, noise and experimental forms, world music, and more. Moraine cofounder Ruth Davidson informs me that Seattle has probably the best weird art-metal scene anywhere in the country, and extreme post-rockers like Sunn O))) are having a big impact outside of Seattle. Figures like Bill Frisell, Trey Gunn, and Stuart Dempster are recognized as master innovators around the globe. While many exceptional players end up following the well-worn path to New York or other big-league entrepots in search of more and better opprtunities, those of us who choose to remain here do so for any number of reasons that may or may not have anything to do with music – the inspiring natural surroundings, human-scale urban core, and so on. Jim: Seattle is a great city with a lot of things happening. Generally, you have to search a bit to find those “happenings,” but there a lot of truly innovative musicians here. The Seattle music scene does tend to move in cliques, with the same group playing the same venues (especially true in the “jazz” scene). 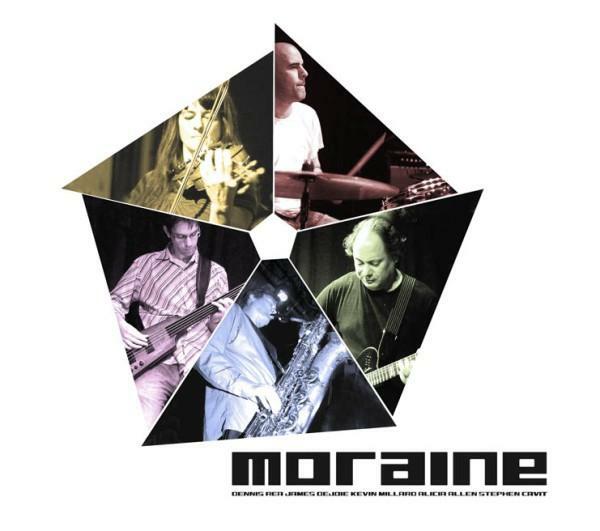 In my opinion, Moraine is one of the top jazz bands going. (I know, I know – jazz has such a bad rap these days, and unfortunately deservedly so!) Moraine sure ain’t Ellington, but I feel we exemplify what I consider the best thing about jazz: adventurous explorations into music. Stephen: The strengths, as with any art scene, lie squarely with the array of great, creative players who make it up. Without a doubt, we have an embarrassment of riches in that regard. When things are good, that creative spirit is accompanied by a supportive, well established, infrastructure of venues and promoters/bookers who care as much for their end of the bargain as us players do for ours. There are some great people involved in booking here and a few great venues to showcase our wares, but for the most part, Seattle is not one of those high-functioning scenes. So far, as a general rule, we find our best opportunities outside of the Northwest. Kevin: In my experience, there are a great many Seattle “scenes,” and the town is full of good music, but it seems very clique-ish. Each genre and sub-genre seems to keep to itself. Fans of one band rarely seem interested in checking out other bands on the same bill. Also, there are thousands of bands (of all kinds) in the area, but we’re all scrabbling for the same short list of decent clubs. Consequently, the venues often take the bands for granted – unpaid (or underpaid) and slighted. But I have a hunch these are very common problems these days – I doubt this is unique to Seattle. 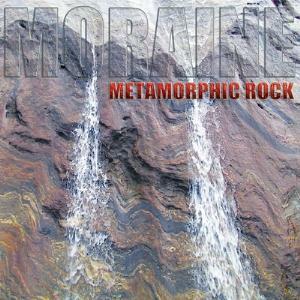 Do you see Moraine as a progressive (rather than “prog”) band? In case you do, how so? Based on many reviews and discussions I’ve seen, a lot of people seem to view us as a prog band. That’s valid to some extent, but I’m the only member of Moraine who has a progressive rock background, so we have to factor in the others’ widely varying musical backgrounds as well. One thing’s for sure, we did not consciously set out to become a ‘prog’ band. If anything, I’d say that Moraine has much more in common with the sort of avant-jazz-rock associated with the Downtown NYC scene; it has always puzzled me why more prog rock enthusiasts don’t embrace that music, which more faithfully carries forward the questing spirit of the progressive pioneers than most of the current crop of prog bands if you ask me. Some reviewers have placed Moraine in the Canterbury or RIO subgenre. I don’t feel that we have much musical affinity to the so-called Canterbury scene since our music tends to be darker, is short on whimsy, and lacks vocals. Not that I’m not a huge fan of several of those groups, particularly Soft Machine. The RIO comparison is much more apt in terms of instrumentation and a somewhat similar compositional approach; I have no problem with that linkage. But in the end, we’re not consciously trying to emulate any models – our influences are going to show through sometimes, but that’s only natural. Do you have any plans for a third album in the near future? I know you have been writing and performing new material in the past few months, and it would be great if Metamorphic Rock was followed by another studio album relatively soon. Dennis: We’re getting close to having enough material for our third CD, which will be a studio effort and will probably see release in fall 2012 as MoonJune has many astounding projects to unleash on the world in the interim. A little bird told me about a possible tour of South America and Europe in the fall or early next year. Any news as to now? Which countries are high on your list? Dennis: Negotiations are underway for a possible tour of Brazil sometime in 2012, arranged through MoonJune contacts. It goes without saying that we would be absolutely thrilled to visit and play in that country, where we apparently have some fans. Several MoonJune artists were there earlier this year for a gigantic festival in Sao Paolo; they were very well received and had a fabulous time. Brazilian music – particularly bossa nova, tropicalia, and musica popular brasileira – have long been a major influence on me. We also may have an opportunity to perform in a major jazz festival in Korea, in which case we’d try to set up additional shows in that part of Asia. The opportunity arose through our recent collaboration with Korean master musician Young Sub Lee, a national treasure in the field of Korean traditional music who was integrated into Moraine for a special performance of our East Asian repertoire, a memorable event. As for Europe, the funding doesn’t appear to be there for that at present. We’d like nothing better than to tour Europe as we’ve gained a lot of fans over there, but realistically it will have to wait until travel funding is forthcoming. We will likely return to the East Coast and make our way farther down the West Coast over the coming year as well. Thank you very much for your time and patience in answering all these questions! Really looking forward to listening to Metamorphic Rock, and hopefully to another East Coast tour.